Oh so tasty and oh so crispy without frying in oil. Yes my friends these little lovlies are baked – NOT fried. Serve them up with Gingered Asian Slaw and the Asian Dipping Sauce. We were in HOG HEAVEN. 1 TBSP Chili Garlic Sauce I use Sambal Oelek but you could just add some crushed red chilis and some minced garlic. mix together well to be sure chicken is evenly coated. Whisk together in medium size mixing bowl. Enjoy! Love it that these are baked…..I’m going to try them tonight! My husband will love them! I made these for dinner tonight. I used chicken tender strips instead of wings. They were supurb! The dipping sauce is perfect. I even made the Ginger Asian Slaw….also very tasty! We had a whole foodo meal ! Thanks for the great idea and recipes. Lots of ingredients, so you have to allow some prep time, but well worth it! Wow – these look terrific. Also, like Pat’s comment (above) about the chicken tender strips. Now I need to round up the ingredients and try these out. Thanx for sharing! These look great! 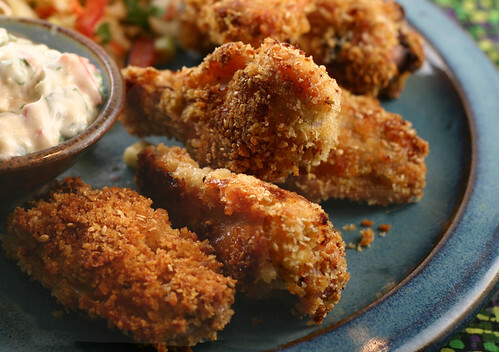 I’ll have to get some chicken wings and give this recipe a try! your wing recipe is simple and they sure do look crispy. Fantastic! Ooo – yum! I like the twist of mayo. Wish I had some right now! those wings look mighty good, perfect for a world series game night! Sounds so wonderful! I love sambal oelek in anything, wings included! Those look so good, and much healthier then fried. About how many eggs made up 1/2 cup? Thanks! These look yummy. These will definitely be made in my kitchen very soon! These looks really, really good and I love that they are baked. Mary, these look great!! I love Asian wings and will definitely have to try them! I’m inviting myself over the next time you make these! Spicy and crunchy~great combination of flavors! I have to try this recipe– look so yummy!!! Wow, thank you SO much for this recipe! My b/f loves chicken, and of course it’s mostly chicken fried in loads of oil – which I find extremely unhealthy! I’ll absolutely try this recipe and I’m sure my b/f will like it! Remember when we ate pounds upon pounds of wings in the middle of a freak snow storm? I’ll never forget it took me two hours to drive 3 miles to get to your house! I believe I demanded you make it – NO acceptions! I probably threatened to call you names if you didn’t make it. I cannot express how good these wings are. I haven’t even made the dipping sauce yet. I did add a little salt to the egg/mayo mixture but included the sesame oil to the this mixture instead of the breading. Used red chili pepper flakes and fresh minced garlic to sub for the chili garlic sauce. I also omitted the butter from the breading. AMAZING with No Guilt. Thanks! How wonderful of you to come back and comment! Glad you liked them Cozy Cuisine!